To start with a key point, the actual games in Rusty's Real Deal Baseball are window dressing for Nintendo's rather quirky interpretation of the free-to-play microtransaction craze. A collection of ten baseball-themed minigames start out at $4.00 each, but players are encouraged to haggle with the eponymous middle-aged dog Rusty to get the real-world prices down as much as possible. It's not exactly the future of digital distribution, but Rusty combines this unique retailing approach with surprisingly deep baseball gameplay for an experience that's at least worth a few bucks. How many bucks is up to you. 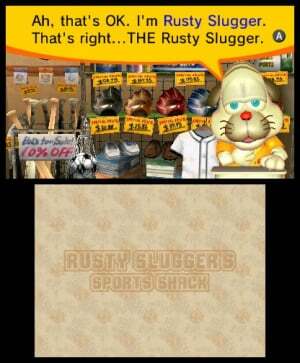 Rusty's Real Deal Baseball is free to download, but you can't get very far without spending any money. 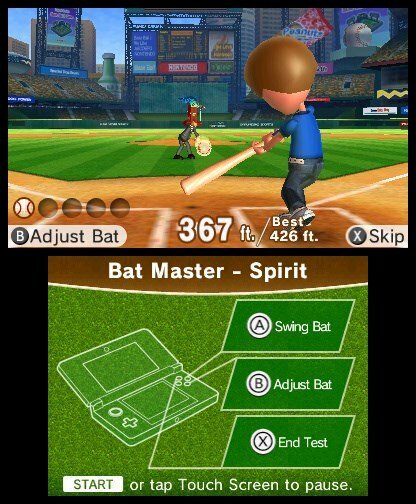 You start out with a free demo of the batting minigame "Bat & Switch," which lets you play its first six small challenges (out of 50). You can unlock one more six-challenge demo after playing for a while, but you'll have to pay for everything else. The haggling mechanics are easy to understand. When you play the minigames you earn items like donuts and nose hair trimmers that you can use as bartering chips with Rusty to get his prices down. The items are plentiful and easy to obtain, and one of Rusty's children even tells you when you've reached the predetermined lowest possible price for each minigame. Of course, a predetermined lowest price is the downfall of haggling with a computer character, but there's not really any other way Nintendo could've approached this idea unless it actually wanted to give games away for free; the lowest price ranges from $1-2 for each of the minigames. 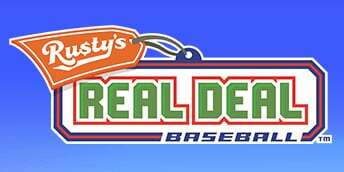 If you were to purchase all ten at full price, Rusty's Real Deal Baseball would add up to $40, but with all the haggling you can get your total for all ten down to $16. Since Rusty and his children are so helpful in this negotiating mechanic, it's hard to imagine many people wouldn't get down to the $16 price point. Rusty's is kid-friendly, so the haggling mechanic brings up the question of whether this real-life bartering is suited for young children playing the game. Rusty holds your hand all the way through the process and gives you plenty of warnings before you purchase the minigames. 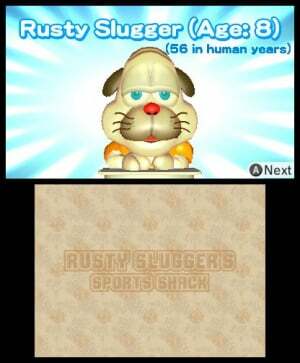 As long as there's an adult around to occasionally monitor what's going on, Rusty's Real Deal Baseball is well suited for children despite the inviting microtransactions. These price negotiations are a big component of this title, though, and it gets tougher and more complex as you unlock more of the games. The ten games in Rusty's Real Deal Baseball are based on individual aspects of playing the sport. All of them require only a few buttons to play, and consist of 50 different challenges that can easily be tried and retried with virtually no loading times. There is no multiplayer to speak of, but you can compare scores with friends via StreetPass. There's a batting cage game that emulates the cathartic "thonk" of your bat hitting ball after ball, a fielding game that simulates the frustration of staring into the sun to catch a fly ball, and a glove-cleaning exercise that replicates the therapeutic action of cleaning a dirty old leather mitt. Even if you're not a sports enthusiast, most American (and Japanese) kids grow up playing at least a little baseball at some point in their childhood, and Rusty's Real Deal evokes those nostalgic feelings. For players outside the small handful of countries where the sport is popular, the nuances of America's Pastime depicted in Rusty's Real Deal may not connect with you; at the time of writing this game hasn't even been confirmed for PAL regions, regardless. In fact, some of the minigames may not even make sense at first if you're unfamiliar with baseball's more obtuse rules and regulations. Speaking of obtuse rules and regulations, if you're looking to purchase only one or two of the minigames in Rusty's Real Deal Baseball, the clear stand-out is "Make the Call," a game where you play as an umpire (referees in baseball are called umpires, for those of you unfamiliar). You wouldn't think the most fun part of a baseball game is where you're not actually playing the game yourself, but calling balls and strikes with the satisfying "STEERIIIIKE!" yell by the umpire is a remarkably rewarding experience. Remember when Wii Sports Baseball provided only a small slice of the baseball experience and you wished it had been more meaty? Rusty's Real Deal Baseball is like ten different small slices of the baseball experience. It makes you wonder what it would be like if Nintendo could somehow combine all of these different minigames into a deep, comprehensive multiplayer baseball game. Strangely, Rusty's Real Deal Baseball features an actual storyline. Rusty Slugger is a former professional baseball player who fell on hard times after his wife left him, so he's opened up a sporting goods store to pay the bills and support his ten children as a single father; shockingly heavy themes of divorce for such an otherwise lighthearted game. 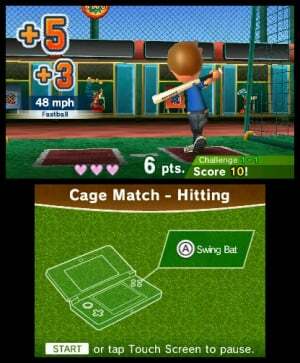 Some kids these days perhaps play video games more instead of real-life sports, so Rusty decides to start selling baseball video games made by successful publisher Nontendo for its handheld console, the 4DS. Yes, that's right. Not the Nintendo 3DS, but the Nontendo 4DS. Because 4DS is better than 2 or 3DS, right? Nontendo is Nintendo's critique the current games industry. Rusty describes Nontendo as a manufacturer of "highly acclaimed baseball software," which can be interpreted as any number of Nintendo's real-life publishing rivals. The technological advancement of the 4DS by simply adding another number to the name of the console can be interpreted as a jab at the PlayStation 4 and Xbox One. In addition, Rusty's Real Deal Baseball revolves around a twisted version of microtransactions, the modern game industry's hot buzzword. The idea of bartering over prices in the increasingly ubiquitous world of digital distribution is an old-world response to the various price models of services like iTunes, Xbox Live Arcade, PlayStation Network, and Nintendo's own eShop. Rusty acknowledges Nintendo's existence, too. At one point we even see a drawing of Nintendo's real-life Kyoto headquarters. Rusty recalls Nintendo simply as a toy company, perhaps a nod to its reputation as a family-friendly publisher. It's more than that, though. 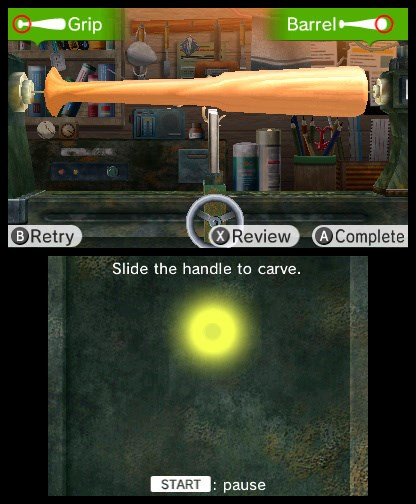 Rusty references the Ultra Machine as part of his backstory, Nintendo's popular real-life baseball toy designed by Metroid creator Gunpei Yokoi back when Nintendo actually was a toy manufacturer in the 1960s. Too bad Rusty doesn't reference Nintendo's other pre-gaming business ventures, such as questionable hotels. The Ultra Machine becomes the symbol of Rusty's Real Deal Baseball. While it sports a clean, Wii Sports-esque art style and a pleasantly unremarkable soundtrack with hints of baseball stadium organ music, almost all the minigames in Rusty's Real Deal Baseball feature bizarre men and women in business suits and Ultra Machines for heads. They're the ones who toss the baseballs for you to hit and hit the baseballs for you to catch. Mr. Ultra Machine (and Ms. Ultra Machine!) remind us of Pyramid Head from the Silent Hill series: they never say a word, but they're omnipresent and haunt your dreams. As you may have gathered from these peculiar references, Rusty's Real Deal Baseball features Nintendo's trademark humour and charm. Rusty himself, however, is not a very likeable balding middle-aged dog. We already know he was altered from his original form in the Japanese release, but we do wonder whether this title could have captured more attention by picking up popular existing characters — some of which are underused elsewhere. With the cute, witty style and the haggling with a shady animal shopkeeper premise, why wasn't this Tom Nook's Real Deal Baseball? Or Crazy Redd's Real Deal Baseball? It's a perfect fit for the Animal Crossing universe, and it would've likely led to more sales for Nintendo with the huge AC fan base. Another option would have been Wario's Real Deal Baseball, since the creepy Ultra Machine Heads would fit the WarioWare aesthetic. Rusty's fine, but didn't strike us as a memorable character to be seen a lot more in the future. If you hail from a part of the world where baseball is a foreign concept, Rusty's Real Deal may not be for you. 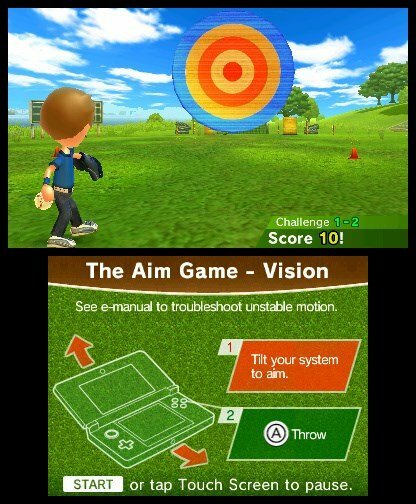 If you have even a passing knowledge of the sport, however, this takes the simple fun of Wii Sports Baseball to the next level and captures the spirit of playing outside with your friends as a kid. The haggling system isn't perfect, but it's unique and approachable enough that Nintendo deserves credit for trying something so adventurous. The amount of content accessible without spending any money is unfortunately limited, but it's easy enough to haggle Rusty down to a buck or two for each of his titles. At the very least, Rusty's Real Deal Baseball is worth downloading. You can decide for yourself how much money you want to spend on it. "You can decide for yourself how much money you want to spend on it." And that's the part I like best about Rusty's. Great review! "It makes you wonder what it would be like if Nintendo could somehow combine all of these different minigames into a deep, comprehensible, multiplayer baseball game"
You forget Mario Sluggers GCN and Wii. I'm enjoying it enough however his bottom line for haggling seems to be 1.50$ I'll probably get all of them at some point. Just wish you could challenge your friends scores on Derby. I'm enjoying it too, much more than I thought I would. I'll probably get all the games eventually, albeit over time and between other downloads I plan to get. Actually I disagree with the part where Rusty is basically forgettable. I think he charming and wouldn't want any other character to replace him. I thing Nintendo did an excellent job with him! Yeah, 7 or 8 is what I would give it. It's a really fun and unique twist on the F2P concept. Great job, Nintendo! @Barbiegurl777 How do you give him back one of his kids? I don't have but the one showing me around the games. Please help as I don't want to spend too much if I can. I have 1.23 shop credit and can but atm! @Daruncic YES!!! That would have been amazing! Nintendo, do something with Waluigi, PLEASE! The demo was pretty good, and the idea of 16 bucks for ten minigames isn't unreasonable if you think about it. May consider picking up the games in tne future since I thought the demo was solid. @TreesenHauser not really, though. Nintendo knew that each game was only worth $1-2 at best, and so this version of "free-to-play" is a farce. The game basically gives you the cheapest prices by handholding you through the process, and the only way you'll spend more than those prices if if you yourself insist on it. None of those games are worth $4. All this game does is make it seem like you're getting a good deal, when the truth is that you're really just getting the real worth of the games. Thats why there's a set low price. If we were truly being allowed to haggle, the haggling system would've been a deeper experience in which, although it rightly should be incredibly difficult to do, any of the games could've been bought for 25 or 50 cents, or even free. If you look past the lie of the haggling system (because thats what it is - a clever, Nintendo way of making you think that somehow their 'free to play' is different than others'), its very easy to see that in reality we're getting ripped off a bit. Seriously, for a single player game that doesn't cost much, you really are getting a lot in this game. @bizcuthammer Nah, not really. Getting ripped off is paying $10 for individual sports that you could very well play on the original Wii Sports and have just as much fun doing so. Paying a few bucks for the games you'd like to play at a couple bucks a piece actually ain't that bad. Played the first demo. It was okay. However I don't think anyone should pay $40 for this game and I wouldn't have downloaded it from the eShop if the price had been $16. @bizcuthammer Each game has 50 levels with increasing difficulty, plus two re-playable Derby modes. Which your able to get all for as little as a dollar each. Imo, not a ripoff. Also, I too found the haggling to be fun. I don't care what you think about the game, but you really don't need to try and tell people their opinion is wrong cause you don't agree. Different things have different values to other people. @TreesenHauser Oh, lol. You beat me to it. I love this game. It has a charm and presentation that drags me in, much like the 4DS represented therein. Unfortunately, my eShop is account is empty thanks to the Guild titles and Steamworld Dig going on sale. So this will be a bit at a time for me, or if I get an eShop card for my birthday come June! I hope Nintendo creates more experiences like this. @TreesenHauser we're still basicall being tricked, even if you think the prices are worth it at $1-2. When it really gets boiled down, Nintendo's free to play system is no different than anyone else's and they need to quit trying to trick us into thinking that it is. @bizcuthammer My opinion still stands. I have $6.94 in the eshop, should I buy a couple games? The demo was spot on. I absolutely love this game. You don't need to even like baseball to have a blast. The F2P aspect aside, the mini games are SO fun and addicting. The whole game oozes with quality. Its exactly what you'd expect from Ninty. I find myself going through my day, CRAVING to play this game. I actually WANT to buy all the mini games because its FUN. For being what it is — a quirky storyline driven collection of baseball mini games with micro transactions — I personally give this 10 out of 10 Rusty pups. If you are on the fence, I encourage you to pick this one up! Nintendo wanted to make something new. If they had made it Animal Crossing Baseball reviewers would be complaining about Nintendo's lack of new IP's so that made a good call imo. It is a great game so I don't think it will struggle in sales and I'm sure people will be surprised how many shell out full price for it. I just hate all the chit chatting. RRDB just sounds like a demo to me. Anyway, it's good Nintendo is trying something different though. @MixMasterMudkip wasnt saying you cant enjoy the game. I was saying that it is untrue that the haggling system is actually giving us these games for cheaper than what they're worth. The fact is that $1-2 is exactly what they're worth, and we're being tricked into thinking that we're somehow paying half price for them by the farce that is the haggling system. The free to play model is ruining games, and just because Ninty does it in a way that seems friendly doesnt mean it isnt the same thing other companies are doing. I dont want to see the free to play model invade Nintendo games. I dont want to one day have a Mario Kart game that, in the old days would've been a $60 purchase for 32 tracks and 30 racers, but because of free to play we get it free, but only with the first 4 tracks and 8 characters and we have to buy the rest of the cups for $15 each and new character packs for $5 each. Or heck, what mobile games are doing and only giving us access to items for a certain amount of uses per day and then charging us $1 to get another 25 uses. Do the math there. That adds up to way more than $60, but hey i guess we don't have to spend it all at once, right? So it seems like its cheaper. All free to play is is just a quick way to make money for companies in a way that rips off consumers. It is just one of the many things that is wrong with gaming today, and i'm not okay with it just because now Nintendo is embracing it. They won't embrace cool things about modern gaming like online multiplayer and high powered consoles, thats fine. Whatever. But if they aren't going to use the good things about gaming today, i sure as hell don't want them using the bad things either, like free-to-play. Or lets call it what it actually is: pay-to-play or pay-to-win in multiplayer games. I dont mind DLC, only if it is truly just an add on and not integral to the game. Like if they do DLC for Mario Kart 8, that'd be ok. As long as the retail game comes with a full game experience and the DLC is just adding extra stuff onto that. Free-to-play isnt the same. It gives companies an excuse to give us only part of a game experience and then charge us more than the full game would actually be worth in the form of smaller payments over time. I'd rather just pay $60 upfront than end up paying $80-90 over time. Rusty isnt this extreme, as Ninty is smart enough to know they have to ease their consumers into this system. But dont be surprised one day if we start to see a more aggressive free-to-play approach by Ninty if this is successful. At the end of the day, Ninty is a company that exists to make $. Just like EA, Microsoft, Sony, Rovio and Sega. They look at market trends and adjust their strategies accordingly. We as consumers vote with our money what we want Nintendo to do. I really believe the reason we havent had a Metroid game in 4 years is because Other M didnt sell very well. Same for the F-Zero and Star Fox series: they just don't rake in the big sales like Mario, Zelda, Wii Fit, Pokemon and Mario Kart do. So if the free to play model starts to make Nintendo big bucks, guess what we're going to start seeing A LOT more of in the future? It wont invade major franchises right away, but it will happen. Imagine a Pokemon game with microtransactions. You can be mad at me all you want, but our $ decides where the future of gaming goes. At the present time, i'd say that industry-wide our money is voting for the wrong things, which is why gaming is the way it is today: because gamers keep using their $ to vote for annual installments of games that barely change, the free-to-play model, and other things. I get that not everyone will agree for various reasons. Some justified, others not. I feel strongly about this issue because i'm concerned about the future of gaming. Some people don't get bothered by free to play, but i've had enough of it to know i dont want it in my Nintendo games. I'm not normally interested in sports related games (or sports related anything) but it sounds like there's some nice variety in the mini games here, which I like. I might just try it after all. @ZachBeacon I agree that no one should pay the full price for any game, but you don't even have to pay $16 for it since you can pick and choose the games you want. Yet Nintendo Life complains that there aren't new IP's! I really gotta laugh if people are looking at this game and saying "See! Nintendo does make new IPs!" I guess they're technically right? the truth is that you're really just getting the real worth of the games. its very easy to see that in reality we're getting ripped off a bit. ...which leads me to conclude he's working from a very interesting interpretation of the phrase "ripped off." @bizcuthammer the problem with that is "worth" and "value" mean different things to different people. Just because it's worth 1-2 dollars to you doesn't mean they aren't worth more(or less for that matter) to other players. About the article: The first mini-game has 100 challenges, not 50 (unless you aren't counting the advanced ones). Anyways, so far I like it more than I thought. I'm not a baseball fan but the mini-games are simple enough. And the best part is it's a $16 game that you don't have to buy all at once! This game sounds pretty intriguing so I might give the free version a shot! I've already downloaded it but haven't taken the opportunity to try it out yet. Perhaps it'll even convince me to purchase all the mini-games someday. I got the game on Thursday and I love it so far. I like Rusty as a character and his tale of family unhappiness that resonates with people who grew with Nintendo games. Plus it is great to see new IPs and characters and to see Nintendo poking fun of themselves. I like that the minigames have tons of challenges, with medals that you can strive for in each of them and endless arcade modes, thus extending the experience. Different minigames will appeal to different people, so the best part is that you don't even have to get the ones you don't like, and for some that you will play for a long time, $1-2 will really be a bargain. I've been playing it like crazy, bought three games so far. It's funny, charming, has great sound, and the games themselves are incredibly addictive. But I'm a jock-nerd who loves baseball. Your mileage may vary. Nice about the comment of what if Nintendo took these ideas and made a good fully-fledged baseball game. They own the Seattle Mariners and the MLB license is available. I wouldn't call it "Free". I don't think it's worth $40 (purchase all mini games) either. Nintendo needs to drop the prices for some games. Just because it's made by Nintendo, doesn't mean it should have Apple prices. And yes, Apple's prices are over priced too. @FattyWhale_42 Woo! Hope you're using Google Fiber. @TenEighty To be fair, the entire point of the haggling system is to get you to NOT pay that much. They even have Rusty's kid saying this on the game's website lol: "$4.00 minigames? Dad needs to do some market research, but don't worry—you can talk him down by listening to his weird stories and earning discount tickets." Great game but the whole haggling thing feels weird...I wish we could "haggle" Nintendo to lower the price of their releases... $39 is too much for the 3DS early released Zelda:Ocarina of Time. By this point, it should be $19.99 like Capcom's 3DS Resident Evil. Glad with the score, you can't ever expect a 9 or a 10 for something like this so this is impressive. Of the three games I bought, Make the Call is certainly my favorite. I think it's pretty fun so far, not mind blowing, but very interesting. I will probably buy one of the mini-games. Yup they should have made a real Baseball game. Still waiting for a real full fledged Baseball game in 3d instead of Spongebobs and Rusty's. Deleted Rusty's after the underhand Pitched batting Practice. However I wish all the Baseball games would go back to the batting mechanic used in Rustys. A real full fledged Hockey game would be nice too instead of the 30 year old Nes hockey. @ekrieg That's not true. I can't speak for the PAL region, but there are certainly some Nintendo 3DS games that go down in price, either temporarily, or permanently in the US. For example, Mario & Luigi: Dream Team is still $28.42 on Amazon and has been for months. Nintendo games aren't immune to the realities of the market. If Nintendo games aren't selling, there will be sales or some form of price drop to get the inventory out (or other marketing related reasons). The reason it seems Nintendo games don't do price drops is because Nintendo games were so successful last generation. Why drop the price if more than enough people keep buying it? It wasn't "at the end" of the console lifespan that the GCN saw the those discounted Player's Choice titles come out. And before someone says "That's just to distinguish the million sellers. ", those titles sold more than a million long before they became discounted. So if you want OoT 3D to drop in price, tell people to stop buying it. It's not the age of a game that determines how much it's sold for, it's demand. i don't like baseball, but i found this game very fun! @TotalHenshin Nintendo got a huge fine from the EU for certain price fixing practices but afaik they still do those things in the rest of the world. Wii U prices are all of the place in the UK. (Most of the best stuff new is about the same price as a used copy of the more popular 3DS games). Project X Zone / Castlevania 3DS / Starfox 64 3D / Mini's on the Move (Included because the amount of content should hopefully be similar). Personally this was a 10/10 game and I haven't even bought any of the minigames yet. This is what nintendo was once before they became nontendo. Its nice seeing something original and quirky. The humor is reminiscent of earthbound for me. Playing the demo game, kind of fun. Not sure if I want to buy it or maybe a different one if any. I have no clue where the other demo is for the game but maybe I'll run into it eventually. This is a weird review. It hops all over the place yet barely touches the most important issue: Exactly how good are these minigames? Wait a minute. So the reviewer feels Nintendo should have used an established character for this game instead of, I don't know, making a new one? Yeesh, even the "journalists" are insatiable. Some great things hit in the review but you're right @BulbasaurusRex none of the games were looked at that much if at all. Am I the only one that thought Rusty was a cat? @MetalMario I think they stole the name from Steam World Dig (Imagine what would have happened had they decided to call the main character Mario in that). "The technological advancement of the 4DS by simply adding another number to the name of the console can be interpreted as a jab at the PlayStation 4 and Xbox One." That didn't occur to me, although it makes sense. Initially, I interpreted the "Nontendo 4DS" to be more of a reference to all of those knock-off products that you often see in Chinese stores, such as the "Chintendo Vii" or "PolyStation." Change structure, let me buy a team in a league that I can play a real full game and I would be happy. If I want better players I should haggle with a different gm to upgrade my player. Or just give us a normal baseball game, ridiculous I have to go to Android or IOS to play a next gen baseball game on the go especially when baseball is such a big sport in both the US and Japan. Bad review.. Doesn't say much about the mini games..HOW GOOD IS IT? I'm loving this so far, its a very unique experience. I think a huge reason is that its a baseball game, something I rarely play unless its got Mario on the cover. The haggling mechanic is a nice, intriguing way of getting you to buy more mini-games. I'm defiantly going to get the Umpire one; gotta love telling someone they're "out," right? Also I find Rusty to be a lovable, sympathetic character and hope to see more of him in the future! I like this game. Rusty and his family are cute. The only major problem I have with the game is it seems to be charging sales tax for each game, which is basically double dipping. The same problem is happening with all paid DLC and it really needs to stop. You should be charged sales tax for a single title ONCE AND ONLY ONCE. Played the limited free version. It seems fun, but at the end of the day, the game is just a ton of DLC. I don't care how you present it. I stand by my rule - if the DLC isn't free, it isn't for me. No exceptions. @TwilightV No it's not actually. If they gave you all the mini games at once for $16 (the lowest amount possible), you'd pay $16 worth of sales tax. If you buy the 10 games seperately, as you do in the game, you will pay for $16 worth of sales tax eventually. It comes out to the same amount. And this is why math in school is so important. great game so far! I got the first 2 games for $2 each. how do you get games to be $1 and can all of them be $1? pretty much when the pup says to stop haggling I do, but wondering if you should stop then and if it is truly at the lowest price? "...The technological advancement of the 4DS by simply adding another number to the name of the console can be interpreted as a jab at the PlayStation 4 and Xbox One..."
I think you're perhaps reading into this a little too much. But if that's the route we're going then please can we over-analyse the Gameboy Horror from Luigi's Mansion? Eh, I thought $10 a sport in Wii Sports Club was anywhere from fair to a steal of a deal, depending on the sport. My favorite was the golf, which had been upgraded to HD, online play with regional clubs, Wiimotion Plus, gamepad integration, added course from NES Golf and added course from Wii Sports Resort. Plus 10% back through DDP means it's really only $9. The other sports, I guess it depends how much you love them- I mean, I LOVE the bowling, so playing in HD finally with online play was certainly worth a ten dollar bill to me (eh em, $9). But for someone who only casually plays from time to time, and doesn't really care about HD or online, I can understand how the bowling and tennis don't seem too appealing. Still, I vouch for the golf through and through! I downloaded this Rusty's Real Deal Baseball, but haven't got around to playing it yet. As a completionist, I already know I'm gonna want to have all 10 mini games. Thing is, I don't feel like haggling forever to get it down to a buck. Probably settle for $2/ea. @McFox i've purchased 3 so far and I would definitely recommend trying them out. Very unique, fun and charming game! Man, I'm having a blast with this. So simple, yet addictive. @JaxonH Admittedly, I'd only be interested in Bowling, but still... to me anyway, $10 each is a lot to ask for sports I can already play on the disc that came with my original Wii. I guess it all depends on everyone's preferences. @bizcuthammer I'm not sure if F2P comparisons are worthy here. There is a finite amount of content to buy for one thing (which makes it DLC or a game having a free demo to draw people in and then a full version IAP purchase). I would think of it more as a bulid your own collection. I'm not sure if a slippery slope will follow from this. This and Steel Diver (btw, Rusty came out first in Japan) are Nintendo tipping their toes in the idea of F2P (but have yet to show interest in the infinite purchase F2P that is so wrong with the industry) and as a result it may not even go anywhere (the AR cards and games that came with the 3DS were a similar toe tipping). Speaking of which the review was kind of lacking on what exactly was available in terms of games but the review was pretty lengthy. But it is just kind of weird to see the game pushed aside in favor of the buying mechanic (which let's be honest here is why most people have an interest in this). So why can't Nintendo replicate the fun, engaging experience I'm having with this game on the Wii U? Why hasn't the Gamepad been used in the creative ways the 3DS is in Rusty's? I just bought The Aim Game and was once again impressed with how the system's features are used. You know what is STILL the only U game to use the Gamepad worth a damn? ZombiU! Rusty's is 1000% percent why the 3DS is so far ahead of the Wii U in every single worthwhile aspect of gaming: it is new, creative software that doesn't use established Nintendo IP. It isn't some rehashed sequel. It uses the hardware in cool, fun ways. It is very clearly made with love and holds your interest for more than a few hours! Seriously, a 7/10 is what this breath of fresh air deserves from NintendoLife? What a joke. Go play Pikmin 3, with its rehashed gameplay and 3-hour campaign, then give it a 9/10. Shame on you, Shapiro. @bizcuthammer I agree with your post #27 and see this, too. The game should be 10$ or 12$ at most, including all minigames, but instead it is getting a 16-40$ price tag. I also find it a bit problematic in view of the target audience which is not only adults. They may easily find out about how to get the lowest price out of the system but this may be very different for younger gamers. @Swiket Heh, and see that IP quickly forgotten by the (need new ip) guys and see the process repeats itself. This has got me very addicted. I need to shell out some cash for this one! I do believe in my short non-paid demo version of this game that this score may be a star higher. We'll see once I buy some of the minigames though. $1.50 is the lowest you can go per game. this game is incredible! Anyone know if there are any Club Nintendo points to be had for buying any of these mini-games? I've bought 2 of them and so far I'm not getting any points for registering or taking a survey. Hopefully I don't need to purchase all the mini-games before that happens. I'm just 5 points away from getting one of this month's games! I've really enjoyed so far. I have half the games and I think they are worth about $2, tho I've gotten a few for $1.50. It's a good thing to have when you buy an eShop game, and then have less than three dollars- this is a good way to spend that change. I'd give it 8.5 out of ten, but I can see where the author is coming from in certain areas, mainly if you don't relate to baseball, but even then, these are good little mini games that serve as great time killers. I'd have really liked some home run derby to play with my custom made bats. This should have been called, "Rusty's real waste of time and money." GOOD game ...... just gotta love baseball!! @bizcuthammer You need to speak for yourself. We're not all being "tricked" into anything by the haggling system, which you seem to think is some devious thing. Lighten up. I've bought all the games and I can say with certainty that they are worth the price. Until you've played the games, you're really not qualified to declare anything about them. I'm an avid baseball fan, and I find this game awesome. @Technosphile What was so bad about Pikmin 3? @StraTTtheRipper Why do you think the whole thing is a waste? Have you even tried the game?